I'm discovering that my passion lies with pattern design so she couldn't have started this series at a better time!! Check out her blog for the full schedule. Just click on the link to the right of this page. 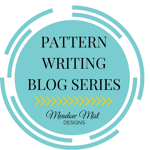 Thanks so much for helping getting the word out on the pattern series! I am so glad you are enjoying it.